Summertime means a lot of different things, but for many families it means hunger. During the months children don’t have access to school meals, how can you help families who are concerned about where their next meal is coming from? We’re excited to share this interview with Derrick Lambert, Program Manager and summer expert at No Kid Hungry, a campaign of the national non-profit Share Our Strength. Hi Derrick! Thank you so much for joining us on the ReadyRosie blog and answering some questions. Can you start by telling us a little bit about No Kid Hungry and the Summer Meals Program? No Kid Hungry is ending childhood hunger through effective programs that provide kids with the food they need, like the summer meals program. We realized one of the big problems was a lack of awareness – families don’t know about the program or don’t know how to find summer meal sites. By teaming up with the USDA, we set up a texting service where teachers, pastors, neighbors, friends, and families themselves could text the word “FOOD” to 877-877 and get a list of sites in their area. The service is also available in Spanish, by texting the word “COMIDA” instead of “FOOD”. What should administrators and community leaders know about summer meal sites? A site is a physical location, approved by the administering state agency, where meals are served during a supervised time period. Summer meal sites may be located in schools, recreation centers, playgrounds, parks, churches, community centers, libraries, summer camps, and housing developments – among many other possibilities. Most sites are qualified as ‘open’ sites, meaning at least half the children in the surrounding community reside in households that qualify as low-income. Open summer meal sites welcome all children under the age of 18 for service at no charge: no identification or registration is required for kids to get a free meal. What would you tell an administrator or community leader who’s worried about there being a site close enough for families to access it? The availability of sites can be a huge barrier to accessing summer meals in some communities. This is often the case in rural areas where transportation can be a challenge and there may not be a lot of places where children naturally gather during the summertime. While the texting service is a great tool to provide information to families about when and where summer meals sites are available, another useful aspect of the hotline is that it also indicates if there are no meal sites currently active in the nearby community. In that case, users are directed to the USDA National Hunger Clearinghouse (1-866-3-HUNGRY/1-877-8-HAMBRE) to receive information and assistance to access other emergency food benefit programs. If a community doesn’t have a site that’s close enough for families to access – is there any way to set up a site? What are the steps? Yes! With summer nearly upon us, the best course of action for a school or community organization seeking to participate in the summer meals program is to identify a sponsor active in your area to partner with and become a site location where meals are served. To find sponsors active in your area, you can reach out to your administering State agency to let them know you are interested in the summer meals program and would like to host a site this summer. Staff at the state agency can then provide information about which organization already sponsors the program locally and recommend the best course of action for initiating a conversation about partnership. Can you talk about the impact of child hunger on families and summer learning? Summer can be the hungriest time of year for many kids from low-income families. 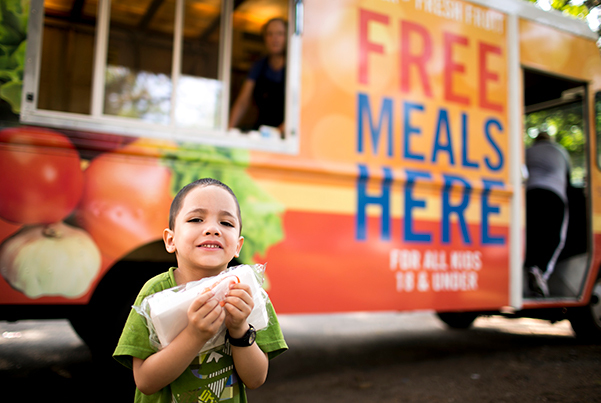 Nationwide, only 16% of kids who rely on free or reduced price school meals are getting meals in the summertime. When school is out and kids no longer have access to school breakfast and lunch, their families’ budgets are often stretched to the breaking point. On average, low-income families spend $316 more on groceries each month during the summer, which too often means making difficult decisions between buying food and paying for utilities or medical care. Unsurprisingly, kids are at a higher risk of food insecurity during the summer months. This hunger can have a long-term impact on a child’s health, ability to learn and general well-being. Studies show that hunger exacerbates learning loss and the “summer slide.” Low-income students who don’t get enough nutrition over the summer months are more likely to fall behind their peers once the school year starts. What’s the one thing you wished educators always asked you about child hunger? Educators know that hungry kids can’t learn and as a result they often provide students food out of their own budget. Many educators don’t realize that there are sustainable programs available in schools that provide nutritious meals to students. Teachers can help ensure kids access these meals each day by encouraging students and parents to take part, learning more about school meals from their School Nutrition Departments, and helping educate other educators. Educators can also make sure they inquire about the possibility of serving meals, like afterschool and summer meals, when they are running programs in their schools outside of the traditional school day. Thank you so much Derrick for this important information! To learn more about Summer Meals and the Outreach Program check out the Summer Meals Fact Sheet, “Three Things to Know About Summer Meals,” a blog post from Derrick that explains the summer texting line. Ana Blagojevic has spent the last 10 years developing educational programs and partnerships with immigrant communities. She’s passionate about leveraging technology as a tool to support learning, strengthen home-school relationships, and build stronger communities.